My experience with the SnoreRX and the SnoreMender is similar to that of a majority of consumers: both MAD devices do a good job in stopping a person from snoring. There are few differences between the two models that are important to note when considering which one to purchase. Understanding several important details about both devices will help you make an informed decision to determine the device that best suits your needs. 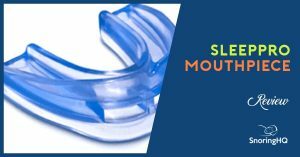 Using MAD technology, the SnoreMender moves your lower jaw forward and allows for a comfortable fit as a result of the soft, flexible construction. The hinged design allows you to easily open and close your mouth. 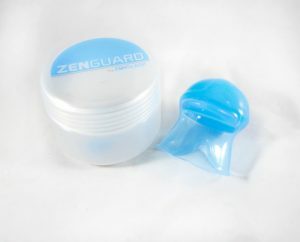 In addition, the air holes in the mouthpiece means you can breathe through your mouth all night long. After ordering the SnoreMender, it quickly arrived in four days. When I first put the SnoreMender into my mouth, I was surprised how little soreness I felt. I realized that this model features Pressure Shift (PS) technology, which redistributes the entire burden to the strong middle teeth. My wife reported that she could not hear any snoring sounds coming from me. My jaw was a little sore but after the third night, the feeling was gone. After the two-week trial, we both were very happy with the SnoreMender. The construction even makes it possible for you to talk normally while wearing it. 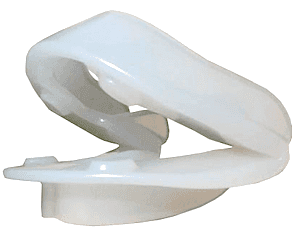 People with a deviated septum or who have illnesses will prefer the SnoreMender as it allows you breathe through your mouth and keep your air passage clear. Cleaning was a very quick process. The soft, one-piece construction took almost no effort at all to scrub with a toothbrush and a little dish soap. 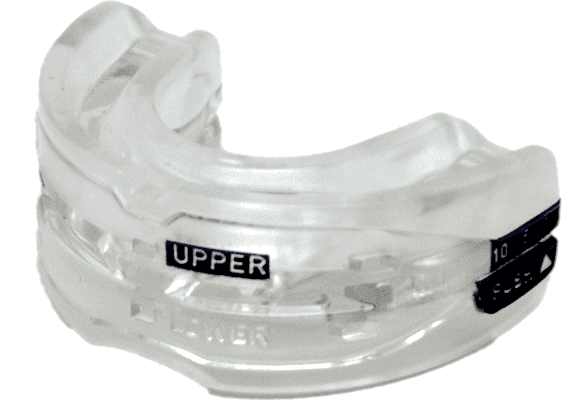 See how Snoremender compares to other mouthpieces. The SnoreRX looks, due to its advanced technology and manufacturing, visually has a different look that other MADs. The ability of the user to obtain a custom fit makes the SnoreRX very attractive to many. You use the boil and bite to obtain a reasonably good fit, and then the special calibrator set at very precise intervals allows you to further adjust until it fits your mouth perfectly. If you have a family member or spouse that might need an anti-snore device, you probably want to order two. Instead of paying $99 plus shipping, the price drops over $20 to $77 when ordering more than one at a time. You need to have some patience with the fitting process. The boil and bite process is fairly easy, but trying to find that perfect fit with the calibrating function can take time. My wife and I slept very soundly the first night using the device. I had some soreness in my mouth in the morning, but my wife must have done a better job fitting hers correctly the first time as she said she felt fine. However, after making another adjustment, the next night’s use resulted in no pain at all when I woke up. Cleaning took quite a while. The cracks and crevices due to the modernistic design made the scrubbing process a bit lengthy in comparison to other devices. Overall, my wife and I found the SnoreRX experience to be a good one. Wearing it was comfortable and it did its job and kept us both from snoring. Both devices function as designed. However, the SnoreRX comes out ahead for several reasons. The SnoreRX’s hybrid and sleek design means it is less bulky and more unobtrusive to wear. In addition, you will not have to worry about soreness as much due to the ability to make fine adjustments. If you are looking for an easier cleaning process, then you may want to choose the SnoreMender over the SnoreRX. Check out the SnoreRX coupon and SnoreMender coupon if you plan to purchase.